The comprehensive compass (SSC300) system includes Maretron’s solid state compass, which provides magnetic heading information. This system also includes a GPS antenna/receiver (GPS200) which provides magnetic variation based on the vessel’s position. The magnetic variation is combined with the magnetic heading within the display to provide the user with true heading. 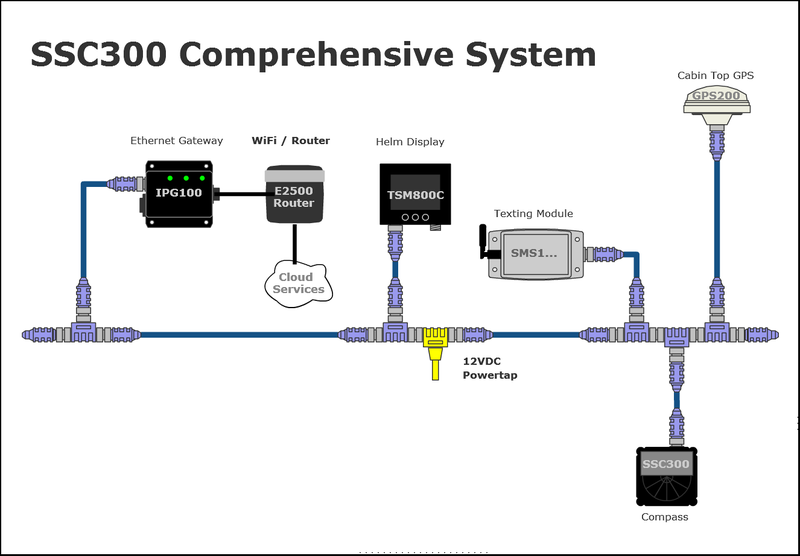 This example system includes an 8” touchscreen (TSM800C) for displaying information about the DC system as well as triggering any associated alarms or warnings. Triggered alarms or warnings can be sent off of the vessel using the texting module (SMS100), for example if the boat’s heading is changing (i.e., swinging on the mooring) or the boat is moving (i.e., broken loose from the mooring or stolen). The Internet Protocol Gateway (IPG100) and WiFi router (E2500) allows the information to be viewed wirelessly on the boat using smartphones and tablets and remotely from the shore with an Internet connection. TSM800C Display 8” Touchscreen displays data in this list and triggers programmable alerts.